These little guys are SO CUTE. 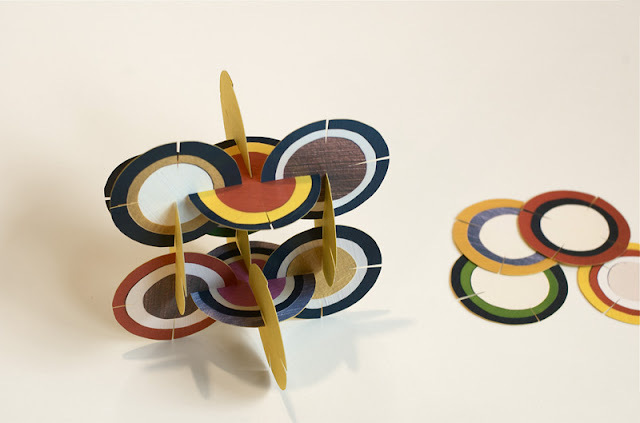 The circle shape is great for making oddly shaped structures, and they're fairly easy for the kiddos to work with (my testers are 3 and 3.5 yrs old). I've got one or two sets lying around the house, and one in my daughter's backpack for playing with at restaurants and other places that have "waiting times." STEP 1: Click on the picture to download and save or print the template (8.5 x 11 sheet). STEP 2: Cut out one circle to use as a master. It doesn't have to be perfect...none of the others you cut out will be either. Once you have the disc cut out, make tiny holes where the little grey dots are marked. I used a tiny hole punch, but a pencil jammed thru the paper will work too. It doesn't have to be pretty. These holes are the guides to mark the end of the slits you'll cut later. STEP 4: Cut out some circles. Take a break, massage your hands, and cut some more. Repeat. STEP 5: Cut the slits. 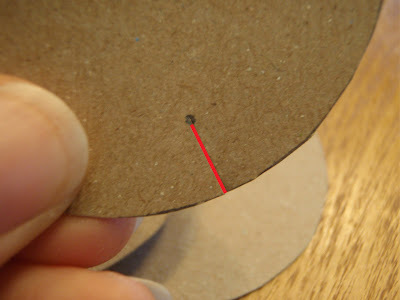 First, cut a line from the edge of the disc to the dot (red line). Try to make the lines perpendicular to the edge of the circle, or the slits will be wonky. 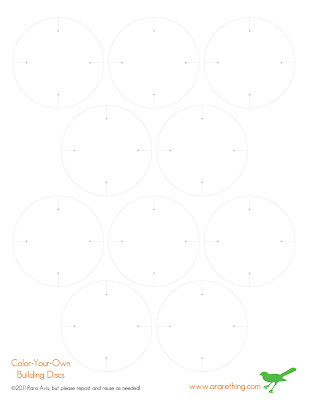 Refer to the original template to see how the first cuts should look (the little grey lines connecting the dots to the outside of the circle). Now, cut another slit just a *HAIR* away from the first cut (yellow line). 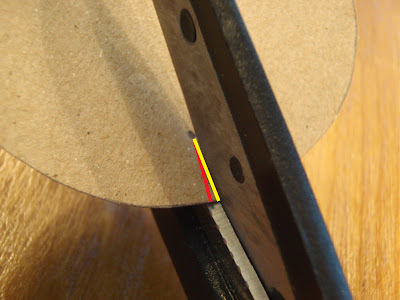 This creates a V-shaped notch that will make it easier for the discs to slide together. Don't make the notch too big or they won't stay together. STEP 6: Now comes the really fun part...coloring! Have your builders decorate the discs in any way you see fit. Crayons, pencils, stickers, whatever! Just don't cover up the slits or the discs won't work. A set of, say, 40 of these little boogers would be a great home-made gift to give a mom of a 3 - 6 year old. IF you want to get fancy, trace the circle template one pictures printed on cardstock...youcould literally build your own family tree. :) Use your imagination. And if you like this tutorial, pass it on. Very cute! Love the little architects!